Who could put it better than the late, great Anthony Bourdain? Food indeed has the power to inspire, astonish, shock, delight and impress. And what greater evidence of this power than taste of sbe - a three month celebration of sbe’s culinary legacy, culminating, for the first time, at our very own SLS Baha Mar in Nassau, Bahamas for the grand finale. That said, what a thrill and an honour, for us at Cacique to be invited to collaborate with leading hospitality-lifestyle company sbe and the rockstars of the food industry, in curating a selection of extraordinary culinary experiences. The final taste of sbe weekend kicked off with a Grand Tasting on the resort’s Monkey Bar terrace, complete with a live sushi demonstration and Bahamian Junkanoo carnival dancers, followed by an after-party at Bond nightclub with performances by international DJ Bob Sinclar. Interactive culinary events included a Grand Dinner White Party with presentations by top chefs ranging from James Beard Award-Winner Michael Schwartz to Master Sushi Chef Katsuya Uechi, an evening of fireworks and nightcaps on the Baha Mar pier, and a farewell brunch at Cleo Mediterráneo. What a line-up! And what uniquely-playful and sophisticated spaces and experiences for us to put the Cacique magic to work. The jet-set flew in from all over the world to indulge in a weekend of sensorial decadence. The chef line up was top tier and included Dario Cecchini, Michael Schwartz and Danny Elmaleh. House music legend Bob Sinclar ensured guests burned off the calories kept with an electrifying performance at Bond nightclub. There were appearances by a handful of A-list celebrities including Michael Jordan and his wife, Yvette Preto, throughout the weekend. Finally, when it comes to the who in charge of design, this is where we take a little bow and step back into the wings. Because for us, a smooth run of show means that you will be so wrapped up in the moment that you will not even feel our presence. Armed with the very best chefs in the industry including Dario Cecchini, Michael Schwartz and Danny Elmaleh. Image by Gather Grow Media. This gastronomic weekend catered to the finest foodie and showcased the very best of SLS Baha Mar. We were honored to be invited to apply the pièce de résistance - a little sprinkling of the Cacique magic. The Cacique magic is composed of the myriad extra touches that take the event beyond what was expected and into the realm of the extraordinary. Extraordinary for the client and guests, not only in venue, design, décor, entertainment and sensorial experience - but equally-importantly in the ease of flow of the narrative, the invisible but essential threads that pull the show together and make the magic happen all around them. “Just Imagine” is more than a tagline to us at Cacique. It’s a mantra. A daily reminder that we are in the business of providing experiences that transcend reality and bend the imagination. 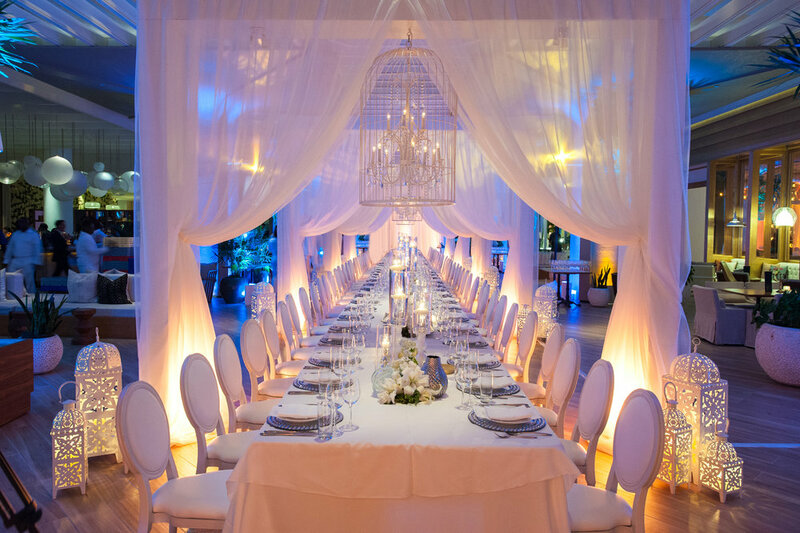 Cacique International is the leading destination management and event design company in the Bahamas, with a twenty-one year legacy of creating exceptional experiences for clients around the globe. Share in the experience or learn more about Cacique International here.